This Friday I will be leading a workshop on Scrum Performance at the Agile Tour in Lausanne. 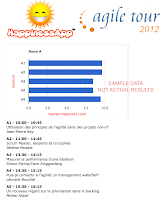 The HappinessApp will also be present, collecting feedback from the participants about their satisfaction with the sessions. Their feedback will be displayed in nearly real time for all the participants to see on a big projection screen during the breaks. Here are some screen dumps and a description of the workflow of the prototype. In Lausanne, a member of the organizing committee will have an iPad and be present in each room. He or she will select the session. At the end of each session as the participants walk out, they just select their smiley and save! Much like the World Happiness Index, their feedback scores are relayed to our server. Then, by the time everyone has gotten their coffee, the consolidated scores will be available. The scores will be displayed on a big screen which updates every 15 seconds while data is being collected. In any case, I look forward to seeing you the Agile Tour in Lausanne!